In a world where we are bombarded by technology and information here you will find the products and help you need to make that mattress buying decision easy. 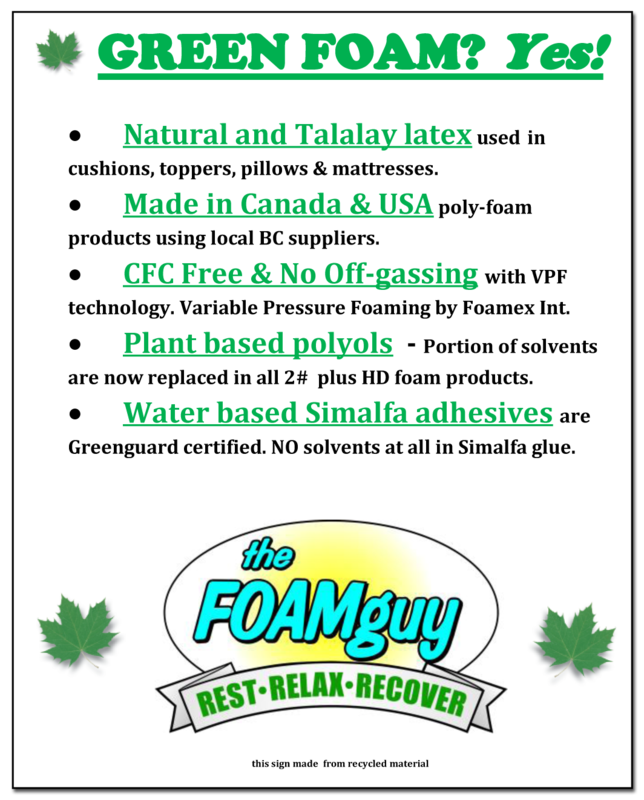 With todays technology and forward moving eco thinking companies like Foam Guy are all about Going green. Naturally derived from the rubber tree, latex sleep products offer an ideal balance of conforming support and pressure relieving comfort. Talalay latex instantly conforms to body contours to provide exceptional, orthopedic support while simultaneously relieving pressure better than many other bedding materials. Latex provides a healthy and luxurious sleep environment. And its breathable cell structure guarantees a comfortable sleeping environment year round. In short, latex bedding makes the perfect environment for naturally deep, restorative sleep. Uniquely Healthy - Talalay latex is ideal for allergy sufferers! It is naturally hypoallergenic, dust mite resistant and antimicrobial, inhibiting the growth of bacteria, mould and mildew. No artificial or synthetic materials have been added to provide these benefits. Fabrics now include: natural organic cotton, Quilted Organic Cotton and cotton percale ticking. Queen Natural latex rubber mattresses with Bamboo ticking start at just $995. In most of our foams either water or CO2 are used as a blowing agents, where needed, which produces no off gassing. In our patented VPF foams, water is used where needed and the foams are mechanically altered reducing the need for extra chemicals. Most of our foam grades are now NATURAL. A portion of the petrochemical used in the manufacturing process is now being replaced with renewable plant based polyols. These plant-based products are plentiful, renewable and help us to produce a more natural product aiding in reducing the carbon footprint. Foamex International uses a method called Variable Pressure Foaming (VPF) Technology that sets the standard in environmentally responsible foam manufacturing. VPF manufacturing provides higher yields from raw materials than traditional foaming methods as well as reducing air emissions. VPF technology exceeds the Clean Air Act requirements. The glue BFF uses is water based and is Greenguard Indoor Air Quality Certified.